Tom Baker is the Doctor in Energy of the Daleks. It was only a matter of time before the Fourth Doctor and the Daleks crossed paths again. If Tom Baker is the quintessential Doctor, than the Daleks are his quintessential foes. From the very beginning of the Doctor’s journey, the Daleks have been there. And from the very beginning of the Daleks’ journey, the Doctor has been there. While the Doctor, in all his incarnations, would continue to cross paths with the Daleks, the 1975 serial Genesis of the Daleks is considered one of Doctor Who’s best episodes, and a very strong reason for this is Baker’s performance. The Time Lords send the Doctor back in time to the planet Skaro, during the height of the war between the Thals and the Kaleds, in an attempt to stop Davros from creating the Daleks and unleashing them upon his enemies. The pivotal moments comes as the Doctor, Harry, and Sarah Jane have rigged the Kaled mutation room, meant to turn the Kaled into bubbling lumps of hate. The destruction of this room would ruin Davros’ research, but more importantly, would eliminate the very first Daleks, from which the entire race sprung, in the proverbial cradle. The Doctor stands ready, holding a stripped wire in each hand. All he has to do is put the wires together to set off the explosives. Even in the face of ultimate evil, and all the hate, genocide, and destruction that he has seen, the Fourth Doctor refuses to be “The Man Who Would” and eliminate the Daleks. It’s an incredibly powerful scene that encapsulates everything the Doctor believes in, that some lines must never be crossed and that, somehow, somewhere, there is a better way. Energy of the Daleks once again sees the Doctor, this time with Leela at his side, facing off with those damnable pepperpots. With a lean and quick-moving script that touches upon nearly everything that a viewer/listener comes to expect from a Dalek story, Energy is a solid story that plays it a bit safe by staying well within known parameters. London, 30 January, 2025. The Doctor and Leela find themselves in Trafalgar Square as a massive protest takes place against the GloboSphere Corporation. After setting up large solar panels on the moon with the capability of generating more than enough energy to meet Earth’s needs, the company has cut a deal with energy companies and national government to delay the collection and transmission of solar power to Earth. As GloboSphere’s security forces brutally break up the protest, Leela and the Doctor are separated. Leela soon discovers that the power behind GloboSphere’s technological advancement are none other than the evil race known as the Daleks, and that they plan to use the massive quantities of energy against an helpless and unsuspecting planet Earth! With Nicholas Briggs involved, one knew that it was only a matter of time before the Daleks popped their heads up in the Fourth Doctor Adventures line. 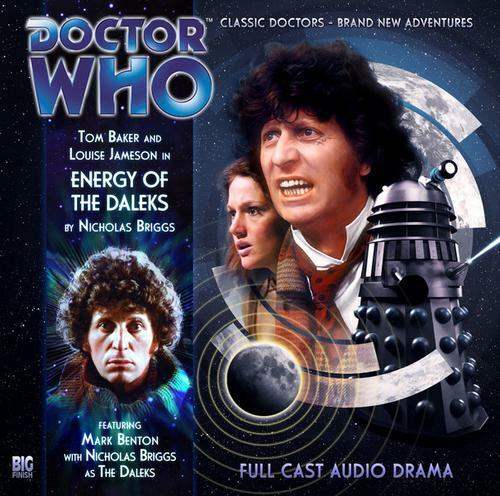 Energy of the Daleks was the first serial recorded by Tom Baker for Big Finish. There’s very little evidence of any difficulties or growing pains; Energy is very well put together, which makes me believe that the problems with Destination: Nerva came about from a weak script as opposed to weak performances or a weak production crew. The script established the world very easily with very little in terms of heavy-handed exposition or anvil dropping regarding the energy crisis. The secondary characters are introduced and laid out in a proper fashion, with just enough of a necessary backstory to make them feel vital to the audio. And the sound is top quality as well, especially the Dalek voices and their weapons. When a Dalek blows up at one point, it even somehow manages to sound like the polycrete models from the 1970’s going up in flames! For Tom Baker and Louise Jameson’s first time together since The Invasion of Time in 1978, the chemistry is there and the rust isn’t. It’s a dramatic 180 degree turn from the frostiness between them in the later period of the run together in serials like The Horror of Fang Rock. Maybe time and tide, maybe just a better set of scripts, maybe it’s just the magic of the TARDIS, and whatever it is, Baker and Jameson slide right back into their roles as the Fourth Doctor and Leela of the Sevateem. Baker hits that note between the seriousness of Genesis of the Daleks and the sheer insanity of his other Dalek story, Destiny of the Daleks. He knows how serious the threat of the Daleks is once their presence is revealed to him, but until that point, we have Baker being the same wide-eyed, big grinned adventurer. He’s the only Doctor who could pull of a line such as “let’s go to the moon” and have it be perfectly appropriate. For his first story for Big Finish, Baker doesn’t show any signs of the years slowing him down. From the moment he steps out from the TARDIS, it IS Saturday night tea time in 1977 all over again, with only a few times during Energy where one can sense he’s trying to channel the Doctor as opposed to being the Doctor. And the same goes for Jameson, as Leela speaks of “this land of London” and “blue guards.” For the first script with Leela, Nicholas Briggs writes her much better than she was during her time on TV; savage, but intelligent, and brave enough to face down the Daleks with the knowledge the Doctor will save her…and also in pain as the Daleks put her to the torture. Jameson goes from the older and wiser Leela from the Gallifrey series to the naive but strong Leela from her time on TV without missing a step, and listening to her on audio during the Fourth Doctor Adventures has been a true joy. And then, there were the Daleks. It’s a Nicholas Briggs script, directed by Nicholas Briggs, starring Nicholas Briggs. The whole thing just screams “DALEK,” with the yelling and the pushiness and the over-the-top, ridiculous scheme to destroy humanity. Briggs nails the Daleks perfectly, right out of the 1970’s, and no one does their voices better than Briggs. Truly, Energy of the Daleks could have, budget and technology willing, been put on the BBC during the Hinchcliffe/Williams years and no one would have batted an eye. Synopsis – A solid, well put together production, Energy of the Daleks sees the renewal of the rivalry between the Fourth Doctor and the Daleks in a story that treads on well-worn/well-treaded ground. 3/5. Tom Baker is the Doctor in…Trail of the White Worm. This entry was posted in Big Finish Review and tagged Big Finish, Daleks, Doctor Who, Fourth Doctor, Leela, Louise Jameson, TARDIS, Tom Baker. Bookmark the permalink.